I just finished reading Chris Coyier’s article, The “Light” CMS trend. For those of you who don’t know, CMS stands for “content management system.” The content is stored in a database and then served up on a page using a predefined template. The idea behind a CMS is to allow non-technical people the ability to update, add or edit the content on their Web site. It also allows multiple authors and can also allow multiple Web sites to share the same content that will be updated in one place instead of on each individual site. Chris points out the problem with most CMSs is that they are really only useful to Web people, those who have experience with working with Web sites. WordPress is Chris’ favorite CMS and mine as well. But as I have done more development with WordPress, I see that is does fall short in really empowering content owners in the way that I would want. A possible solution: “light” CMSs. There are a growing number of these solutions available on the market today. Several of them are free services and at least one of them costs money. One of the reasons that I like WordPress is that it is free, open source software that is continually developed. The price is right for the non-profit organization I work for. These light CMS solutions contain less features which make them simpler, and I believe, a better user experience for the content owner. Unify – Currently in private beta. It is a product of Unit Interactive which is headed up by Andy Rutledge, one of the designers I follow on Twitter and RSS. I was not able to take a close look at it. Cushy CMS – this seems to be the first player in the light CMS. It is a free service. Page Lime – in free public beta. It has a visual editor and reminded me of Contribute. 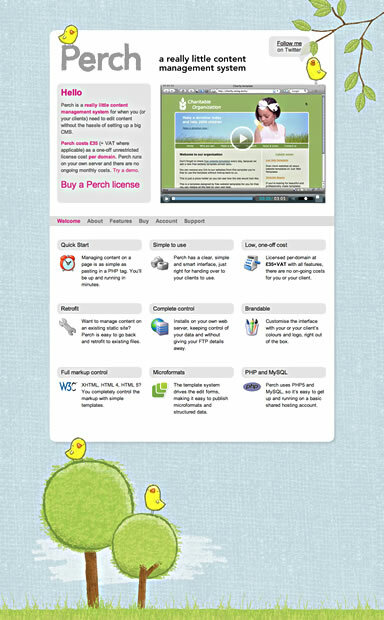 Perch – I really like their Web site and they have great documentation. Perch costs about $57 per domain. You host it on your own server. Anna Debenham reviewed Perch on this week’s Boagworld Podcast. She has also used Cushy CMS. She pointed out that the major advantage of using Perch over Cushy CMS is that the files are all hosted on your own server with Perch. She had problems with the Cushy CMS server going down which meant the service was unavailable. PageLime is also hosted on their servers. Cushy CMS, PageLime, and Perch have videos introductions about their service and good documentation to get started. It seems pretty easy to implement any of these three solutions. Cushy CMS and PageLime involve adding classes to your HTML code. Perch involved using specific PHP tags and reminded me a lot of WordPress. From the little research I did this afternoon, I believe that Perch would be the product that I would choose. Yes, it costs money, but the big advantage is that you don’t have to worry about another server going down that you have no control over. As I mentioned, some of it’s features remind me of WordPress. It would take more technical knowledge to setup Perch. It looks like their templating system is quite powerful and gives more control to the Web designer or developer. But the advantage it has over WordPress is it’s simpler interface for the content owner. One final note: I really liked Perch’s site. It has nice texture and illustration. It uses JQuery for some fun animated effects. The birds in the tree at the bottom animate and move into the screen on pages where you can see the footer right away. Security is definitely a concern with WordPress. But like anything, you need to know how to use the tool and there are ways of hardening WordPress that make it more secure. http://codex.wordpress.org/Hardening_WordPress is a good article on how to harden the install. There is also a plugin, http://wordpress.org/extend/plugins/wp-security-scan/ that is helpful for making WP more secure. I have several best practices in place to help minimize the threat.